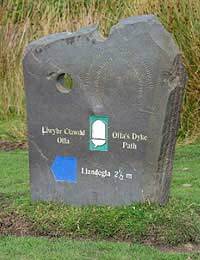 Offa’s Dyke Path was opened in 1971 linking Sedbury Cliffs near Chepstow on the banks of the Severn estuary with the North Wales coastal town of Prestatyn which overlooks the Irish Sea. It’s named after King Offa who ruled the Kingdom of Mercia back in the 8th century and its thought he built the dyke to separate his kingdom from Powys, another rival kingdom, back in Anglo-Saxon times and which still exists today as part of Wales. Starting out in the south from Chepstow and heading north, the trail passes through eight different counties and criss-crosses the border between Wales and England more than 20 times. It follows tranquil marshland and passes through Brecon Beacons National Park on the 1000 foot high Hatterall Ridge where you can experience spectacular views of the landscape beneath you. You’ll get to visit the town of Hay-on-Wye which has become a bit of a ‘Mecca’ for book and literary enthusiasts and the path also links three Areas of Outstanding Natural Beauty – the Wye Valley, the Shropshire Hills and the Clwydian Hills with its famous Clwydian ‘moels’ – the 1820-foot Moel Famau and Moel Arthur with its Iron Age fort. The final section of the walk leads you on to the cliffs of Prestatyn and, though this section is less demanding than some of the previous ones, a popular tradition for those who complete the entire path south to north is to go for a paddle in the Irish Sea from the beach in Prestatyn. However, many people also opt to walk the route in the other direction. If you were to walk it all in one go, it would probably take you somewhere in the region of 12 to 16 days. However, because of its quite difficult terrain, many people opt to complete short sections at a time on day trips and fill in the missing sections on subsequent visits until they have completed the entire trail. It’s because of this trend that there are places to eat and easy to find accommodation along much of its route in nearby towns and villages and public transport is available to and from most of its key points of access. Tintern Abbey, close to the start of the walk if you’re heading north from Chepstow, is one of the great Cistercian monastic ruins and the first one of its kind to be built in Wales, dating back to the 12th century. It even inspired William Wordsworth to write a poem of the same name. Chirk Castle is the last of the Edwardian castles in Wales which is still lived in today. It has magnificent award winning gardens and is set in a stunning location overlooking 9 counties. The town of Hay-on-Wye is a must for book enthusiasts and Penycloddiau Hill Fort in the Clwydian Hills is one of the largest hill forts in Wales and is clearly visible from the top of Moel Famau. National rail and bus services go to both Chepstow and Prestatyn and service many other towns along the Offa’s Dyke Path. Make sure your information is available in tourist information offices, they'll be discrete about who they give the information to - you do not necessarily want to openly advertise the sole female aspect. The Ramblers association and the Long Distance walkers association would be good to contact. Thanks Jeff, we'll bear those in mind for future articles.